The blog's inaugural birthday celebration continues this week with another giveaway and what a package I have for you hair lovers this week. 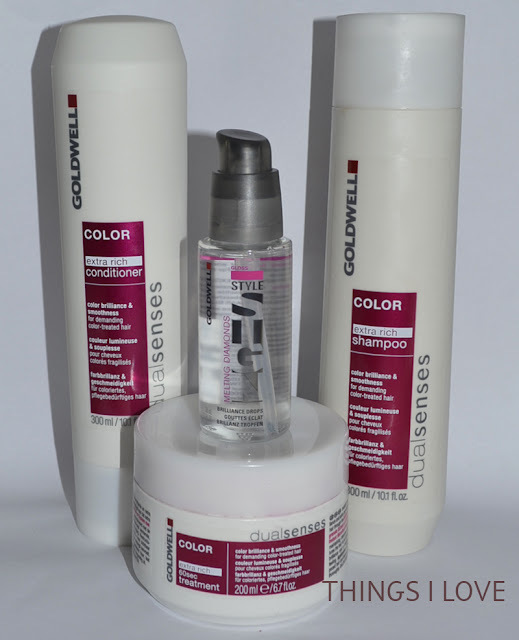 Thanks to Goldwell, you could be the envy of friends and colleagues which this protecting and restoratiEve haircare pack from the DualSenses range which not only smells divine but has the quick acting quick-acting Microfluid technology and pomergranite extract and UV filters to protect your rich new hair colour. Be a follower of this blog via Google Friend Connect or a subscriber via email. Comment below on what is the one thing you want to change about your hair and note down how you are subscribed to this blog. For an extra entry, tweet about this competition and at @lilpil99 so I can track your tweets. This competition will run until Sunday 21st August 8:00pm AEST. 2 winners will be drawn randomly the day after 21st August and announced on the blog. I am a subscriber via email. I want to change my hair's frizziness, especially after it's just been washed, and make the colour last longer after colouring. I have also tweeted. Thanks for the opportunity to win such a great giveaway! I would love to change the lack of volume in my hair! No matter how long it gets, it's still seriously flat! Count me in! I would like to change my hair colour. I'd love it to be soft and silky 24/7, not coarse, dry and damaged with colour fade! I want a hair colour change! I'd love to try a hazelnutty gold brown colour! Following your blog via GFC (Alicee) and following u on twitter @ak323. Already a follower via GFC .. i wish i could make my hair more thick and long ...also tweeting ..
Id love id my hair was more voluminous! im following you on GFC and ive tweeted about your giveaway! I just tweeted (chocolatelace) and following your fantastic blog via GFC. I'd love if my hair if it was longer, no split ends and a constant mirror-shine finish...I will keep dreaming! I subscribe by email and gfc (Sarah - science if beauty). I want ny hair to be less frizzy with lovely bouncy well defined curls. Congrats on you first bday! I want to change not one thing but everything about my hair. I want hair like Sofia Vergara. I'm going to ABBW & IMATS!